Spend three days deep in the forests of northern Thailand, learning about the behaviour of former captive elephants which have been returned to their forest home. Forage for food, fish from rivers and learn other bush skills, all in the company of the expert mahouts. Camp out overnight in the forest and spend two nights in a village homestay with a friendly host family from the from the Karen hilltribe. This extension provides the opportunity for a unique experience in Asia - to spend time witnessing elephants roam in their natural habitat. This has been set up by one of Explore's close partners, Mahouts Elephant Foundation, a UK charity working to improve the lives of Asian elephants. This morning you will be collected from your hotel in Bangkok and transferred to the airport for the short flight north up to Chiang Mai, Thailand's sleepy garden city. Upon arrival you will be met by a representative and driven into rural north-west Thailand, a journey of four hours and home to Thailand's hilltribes. The destination village is home to the Karen tribe, the largest of Thailand's minority tribes and thought to originate from neighbouring Burma (Myanmar). Often confused with the so-called \ long-neck tribes\ (which are actually the Padung people), the Karen are principally subsistence farmers that are adept at cultivating rice and other staples in the lower mountains. They are also known to be skilled weavers, and have always shared a close affinity with elephants, serving as mahouts (elephant keepers) for generations. On arrival in the village, you will meet the host family who will welcome you into the comfortable guesthouse before taking you on a short tour of the village, breaking the ice and serving as the first introduction into Karen culture. Tonight you will dine with several of the villagers, sampling freshly prepared Karen food. Meals are usually a selection of in-season vegetables picked from the local area along with chicken or pork served in a spicy, hearty stew. And of course sticky rice, the Thai staple! The village guesthouse is next to the host family's home, it is equipped with comfortable Karen-style mattresses (on the floor rather than raised on a base), duvets, mosquito nets and a private bathroom and shower. After breakfast with the host family this morning you will set off on the walk to the forest camp, a walk of approximately one hour. Once here, you will be able to leave your overnight gear inside the tent before venturing further into the forest with the mahouts in search of the elephants. Please note you will be required to carry your own bag to and from the camp, so we recommend packing lightly with only the items you require. During the trek the mahouts will teach you some basic skills in how to track elephants in the forests and how they forage for food from the undergrowth. Once with the elephants, we will spend the remainder of the day observing them in the natural habitat, learning about the natural behaviours of an elephant, the types of vegetation they eat and the benefit of allowing these elephants forage for themselves. Dinner is served back at the base camp around a fire, and will likely be fresh river fish caught by the mahouts earlier that day, followed by a selection of vegetables foraged from the surroundings areas. Mattresses are provided within the tents complete with bedding, pillows and solar power, allowing for a few hours of electricity for a reading light or to charge camera batteries. Please note this campsite is wild, and therefore there are no shower or bathroom facilities. Toilets are \ al fresco\ . You will wake this morning to the sound of the forest, with the birds singing and the gibbons calling whilst breakfast is prepared for you by the mahouts. After a leisurely breakfast you will once again make your way deeper into the forest for the amazing and unique spectacle of watching these elephants roam in their natural environment. This programme has been put together by the Mahouts Elephant Foundation, a UK-based charity that is dedicated to improving the lives of Asian elephants. As well as setting up this incredible experience, they work towards changing attitudes within tourism, aiming to end cruel elephant shows and elephant riding packages by working towards moving elephants to a protected forest habitat. This model gives the elephant tourism industry and its mahouts a credible alternative, to be able to earn a living for their families and for the local economy to directly benefit, all while providing a safe and caring environment for these gentle giants. After another morning spent with the elephants and learning of the good work being done here, you will say goodbye to these beautiful creatures and start the walk back to the village homestay. This evening at dinner there will be the chance to learn a little more of the Karen culture, and to try your hand at some of the traditional industries they practice such as basket weaving or textile work. After breakfast this morning you will be collected from the village and driven back to Chiang Mai, a journey of approximately four hours. The trip ends at Chiang Mai airport. Pack essentially for hot weather. Bear in mind that the region is tropical (humid) and that days can be very hot. Lightweight rainwear or an umbrella is advisable all year. Casual clothes are the most practical and something with long sleeves and long trousers for the evenings. A fleece is also recommended for the cooler evenings. Comfortable walking shoes for the forest are highly recommended, along with a pair of sandals for crossing streams or for the evenings. Accommodation on this trip is rated as 'Simple' and 2 nights will be spent in a village guesthouse, with 1 night in a wild camp. The village guesthouse is next to the host family's home, it is equipped with comfortable Karen-style mattresses (on the floor rather than raised on a base), duvets, mosquito nets and a private bathroom and shower. For the camping, mattresses are provided complete with bedding, pillows and solar power, allowing for a few hours of electricity for a reading light or to charge camera batteries. Please note the campsite is wild, and therefore there are no shower or bathroom facilities. Toilets are 'al fresco'. This extension can be added on to any of our trips that start or end in Bangkok, or can even be booked on its own. 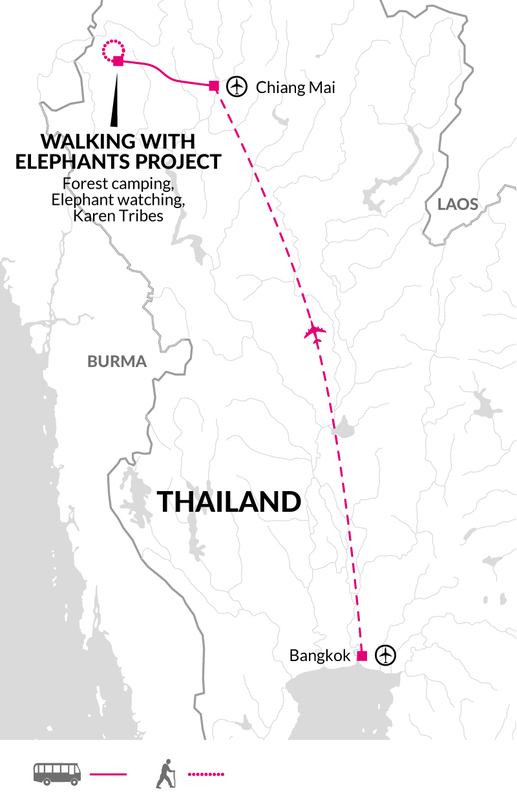 The trip is booked in conjunction with the Mahouts Elephant Foundation, a UK charity that has set up the "Walking With Elephants" experience, so by travelling on this trip you will be directly contributing to the Karen village, the mahouts and the excellent work being done here. As this is booked in conjunction with MEF please note it is not exclusive to Explore and therefore you may be sharing this experience with other travellers.